Includes: 5mL Dynabeads CD8 coated with anti-CD8 monoclonal antibody. 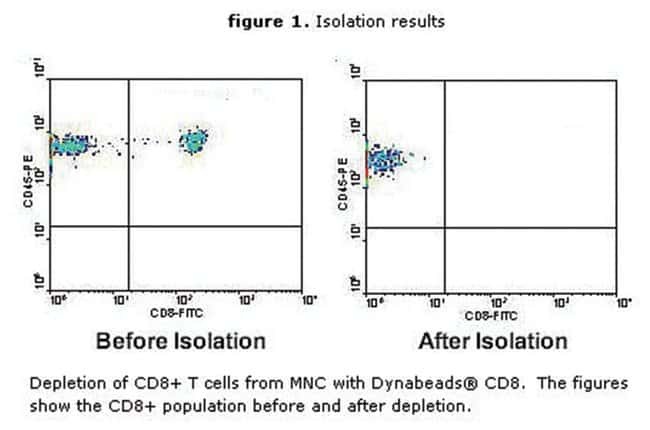 Dynabeads CD8 are superparamagnetic beads coupled with anti-human CD8 antibody that enable easy isolation or depletion of human CD8+ T cells directly from any sample, including whole blood, bone marrow, buffy coat, mononuclear cells (MNC), and tissue digests. Includes 5mL Dynabeads CD8 coated with anti-CD8 monoclonal antibody.